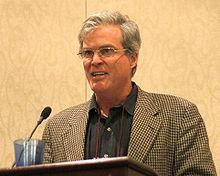 John Horgan (born in New York, 23 June 1953) is an American science journalist best known for his 1996 book The End of Science. He has written for many publications, including National Geographic, Scientific American, The New York Times, Time, Newsweek, and IEEE Spectrum. In the early 1990s, I came to suspect that the quest for a unified theory is religious rather than scientific. Physicists want to show that all things came from one thing: a force, or essence, or membrane wriggling in eleven dimensions, or something that manifests perfect mathematical symmetry. In their search for this primordial symmetry, however, physicists have gone off the deep end, postulating particles and energies and dimensions whose existence can never be experimentally verified. (2002 wager, 18 year duration) Bet 12 (John Horgan vs. Michio Kaku). longbets.org. Our descendants will learn much more about nature, and they will invent gadgets even cooler than smart phones. But their scientific version of reality will resemble ours, for two reasons: First, ours… is in many respects true; most new knowledge will merely extend and fill in our current maps of reality rather than forcing radical revisions. Second, some major remaining mysteries—Where did the universe come from? How did life begin? How, exactly, does a chunk of meat make a mind?—might be unsolvable. (13 April 2015)"Was I Wrong About the "End of Science"?". Cross-Check (blogs.scientificamerican.com). Over the last few decades, physics in the grand mode practiced by Hawking and Rees has become increasingly disconnected from empirical evidence. Proponents of string and multiverse models tout their mathematical elegance, but strings are too small and multiverses too distant to be detected by any plausible experiment. (19 November 2018)"The Twilight of Science's High Priests". Cross-Check (blogs.scientificamerican.com). In Theories of Everything... John Barrow argued that Gödel's incompleteness theorem undermines the very notion of a complete theory of nature. Gödel established that any moderately complex system of axioms inevitably raises questions that cannot be answered about the axioms. The implication is that any theory will always have loose ends. Barrow also pointed out that a unified theory of particle physics would not really be a theory of everything, but only a theory of all particles and forces. The theory would have little or nothing to say about phenomena that make our lives meaningful, such as love or beauty. Einstein had drawn attention to nonlocality in 1935 in an effort to show that quantum mechanics must be flawed. ...Einstein proposed a thought experiment—now called the EPR experiment—involving two particles that spring from a common source and fly in opposite directions. Of course, the apparent disarray could have stemmed entirely from my own ignorance. But when I revealed my impression of confusion and dissonance to one of the attendees, he reassured me that my perception was accurate. “It’s a mess,” he said of the conference (and, by implication, the whole business of interpreting quantum mechanics). The problem, he noted, arose because, for the most part, the different interpretations of quantum mechanics cannot be empirically distinguished from one another; philosophers and physicists favor one interpretation over another for aesthetic and philosophical—that is, subjective—reasons. I had barely sat down when he began to tell me... that science writers were "ignoramuses" and a "terrible breed" who invariably got things wrong: only scientists were really qualified to present their work to the masses. As time went on, I felt less offended, since it became clear that Gell-Mann held most of his scientific colleagues in contempt as well. One of the things that makes Gell-Mann so insufferable is that he is almost always right. This page was last edited on 26 November 2018, at 14:42.